This is one of my images from the Photoshop class I took last summer. It's in the upstairs living room in my grandfather's house, my lamp on the old Mission desk. The leather frame is from an old album that was Grandpa's. 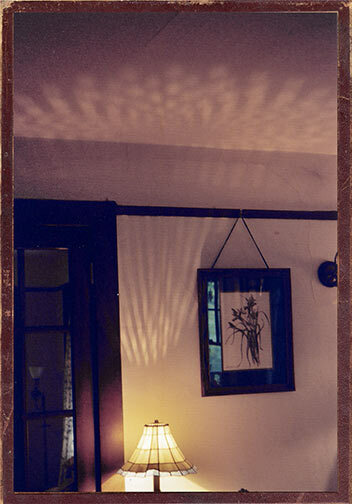 And I do love the way lamps like this cast patterns of light on the wall & ceiling. And that, this time, I was able to get a good image of it. The image has been Photoshopped to bring out the best in it, and remove an artifact line across it from the scan. Other than that it's pretty much as the camera saw it.